This is what Arsenal fans demanded of their team, and they got it. And how. In what was billed as the most evenly contested North London derby games, in recent years, Arsenal proved to be a class above their fiercest rivals, as they staked their claim as London’s premier club. After the 5-3 beating handed out to Chelsea, it was Tottenham’s turn yesterday, as they spectacularly crumbled 5-2 to the Gunners. Surprisingly, instead of starting with 2 out and out wingers, Arsenal started with a second central midfielder, in Yossi Benayoun, who partnered Arteta, Rosicky and Song. Walcott, played in the hole behind van Persie. Laurent Koscielny and Kieran Gibbs both passed late fitness tests, to bolster the Gunners’ defence. Spu*s dropped vice-captain Michael Dawson to the bench, and started with a central defensive pairing of Younes Kaboul and Ledley King. Apart from that, they had Rafael van der Vaart returning from injury, who was on the bench as well. As expected, Redknapp started with Saha and Adebayor upfront. It seemed like another dark day in Arsenal’s season, as Spurs took the lead as early as the third minute of the game. Adebayor found Saha in ample space, and the French striker’s shot deflected off a backtracking Vermaelen past Szczesny. Arsenal responded with some fine attacking moves, as they dominated possession thereafter, and created many opportunities on target. van Persie’s close range shot missed by inches, while Rosicky lost his marker Bale, but his header was parried away by Brad Friedel. Soon, it looked like Spurs would take a stranglehold of the match. Gareth Bale marauded his way into the Arsenal defence, but was subsequently adjudged to be fouled by Szczesny. Who else, but Adebayor to take the penalty. He sent Szczesny the wrong way, and Spurs had a 2-0 lead at the Emirates. Arsenal set about the task of rescuing the game, and did it with ferocious pace. van Persie’s brilliant shot struck the bar, and it fell to Mikel Arteta, whose cross, was met with aplomb by Bacary Sagna. And 3 minutes later, matters were level, as Walcott and Benayoun caused confusion in the Spurs’ defence. van Persie found himself in a shooting position, made space himself, and sent a screamer past Friedel. Redknapp tweaked his formation a bit in the second half as he bought on Sandro and van der Vaart in place of the ineffective Kranjcar and Saha. Arsenal started the second half where they had left the first, as they made forays into Spurs’ defence. Yossi Benayoun found himself in space, but his shot was well judged by Friedel. 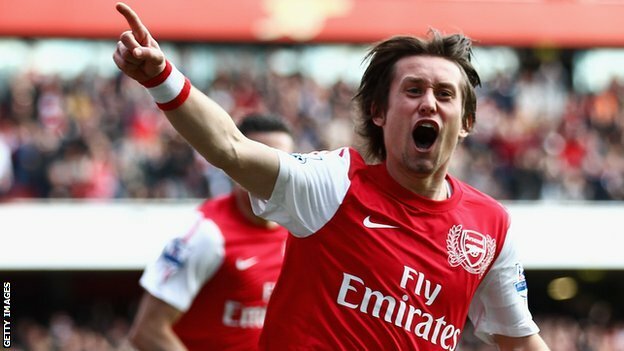 Soon enough, the star of the match, Tomas Rosicky, played a 1-2 with Sagna, and finished, ahead of a slow Ledley King. Arsenal had turned it around, in no time. Arsenal continued in the same fashion as they fashioned attack after attack. Theo Walcott, who has had an average season, and was poor in the first half, made up for a poor first touch, and slotted past Friedel. His celebration told how much that goal meant for him. And 3 minutes later, Spurs were ripped apart, as Walcott found himself in an offside position, with only Friedel to beat. Beat, he did, and the early anxiety in the stadium was now complete pandemonium. Arsenal continued passing the ball, attracting ‘Ole’s’ from the crowd, as they subjected a toothless Spurs’ to humiliation, in the North London Derby. Now, they know who the kings of London are. Szczesny (7.5) – Conceded a penalty. Apart from that, a commanding performance. Sagna (8.5) – Brilliant game from Mr. Consistent. Not only did he keep Bale under a tight leash, but also scored the goal, which sparked the comeback, and provided the assist for the 3rd goal. Vermaelen (8) – Was found wanting on a couple of occassions. But, another dogged display. Koscielny (8) – Put in another brave display. Had Adebayor in his pocket. Gibbs (8) – A good return in a high-intensity game from the young left-back. Song (8) – Kept possession brilliantly. Rarely lost the ball, and retrieved the ball on numerous occasions. Rosicky (9) – Man of the Match display from ‘Little Mozart’. He was brilliant all round. His running, tracking all perfect. Arteta (8) – Channeled the ball well throughout the game. Benayoun (8) – Justified his surprise inclusion with some fine play. Walcott (7.5) – Bereft of confidence in the first half, he scored 2 vital goals, not only for himself, but the team. van Persie (8.5) – Scored a stunning goal, and the centre of everything good. Jenkinson (8) – Had little to do, in a game already won. Oxlade-Chamberlain and Gervinho– Came on too late to get a rating. Previous: Spu*s Preview + Team News + Loads of Other Stuff..